CUPCAKES: For the cupcake base, I used Billy's Vanilla recipe. I really love this recipe. 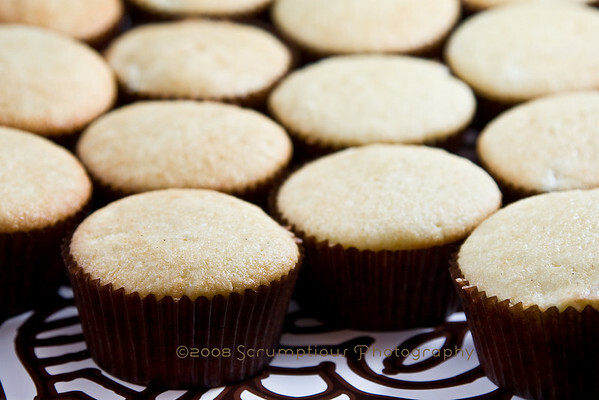 At first it seemed weird to put the butter into the dry ingredients without creaming it first, but it's been great each time I've used it -- the cupcakes come out very light and moist with a domed top. I still get a little scared when there are lumps of butter in my batter, but it always turns out OK. PASTRY CREAM: I used Dorie's recipe for pastry cream from Baking (surprise, surprise). The cupcakes probably only needed a half-recipe to fill them all. There are a lot of good pastry cream recipes around; if I didn't have Dorie's book already lying open on my counter, I might have used the one here, which is also from a Dorie book and probably the same thing. 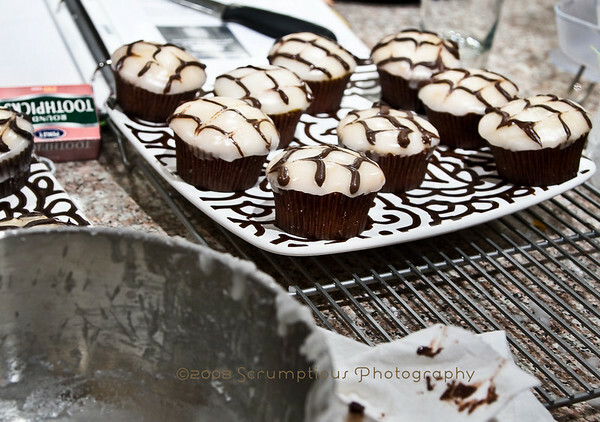 POURED FONDANT: Grazie mille to Joe Pastry for his awesome picture tutorial on poured fondant! I had to make the first part of the fondant twice, because I misread the temperature and ended up heating the sugar to 258 degrees (hard ball -- BAD!) instead of 238 degrees (soft ball -- GOOD!). The second time around, it worked right and I refrigerated it overnight. Of course, if you don't want to go through all of that trouble with the food processor, you can use Wilton's "Quick Pour" recipe using confectioner's sugar. (You still have to heat it up, but you don't have to go through the food processor step. Not sure what the results are like, since I didn't test it out -- I imagine there wouldn't be the same crystalline texture of the other fondant.) Alternatively, you could try a powdered fondant mix, sold at baking supply stores. 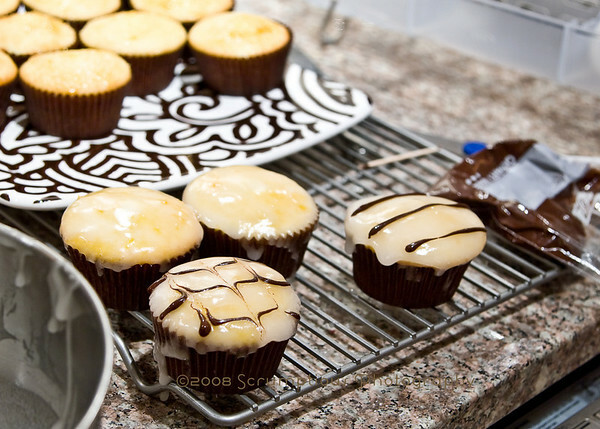 FILLING THE CUPCAKES: The best method for filling these cupcakes is to use a pastry bag. 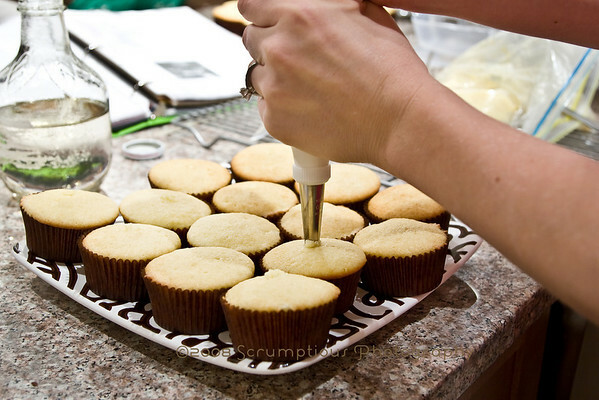 Since the cupcakes are dipped into fondant later on, this method keeps the top of the cupcake intact for dipping. You can fit it with a "cupcake filling" tip, like I've done, or try a star tip. Fill the bag with the pastry cream and just squeeze some out into the cupcake. A. made me weigh one of the cupcakes before and after filling -- there turned out to be 12g of filling inside. 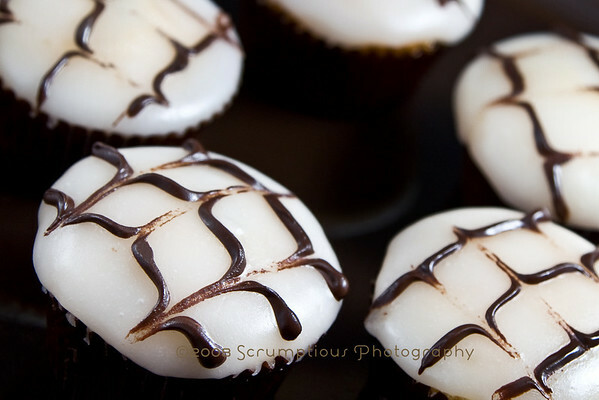 DECORATING: I found an awesome tutorial on how to cover cupcakes with poured fondant here, which I attempted to follow. My fondant was extremely drippy, especially at the beginning -- I guess it was a little too thin. I ended up dipping each cupcake twice, and you could still see the cupcake slightly through the fondant. It was kind of a frustrating process, but towards the end it did get easier. Before applying the fondant, brush on a layer of melted jam, which helps to even out the surface of the cake and help the fondant to stick. I used apricot jam, since it has a mild flavor (and it seems to be what everyone uses). I didn't taste the jam in the end product. Once the jam is cool, heat the fondant in a double boiler and thin with a little simple syrup or water. (Refer back to the fondant tutorial for pics.) The consistency should be fairly viscous but still workable. I don't have much experience with it, obviously, so all I can say is that it is trial-and-error to get the right consistency. According to the tutorial, "If it gets too thick you will have difficulty to dip the cupcake properly, and if it is too thin it will look transparent on the cupcake." Dip a cupcake into the bowl of fondant. 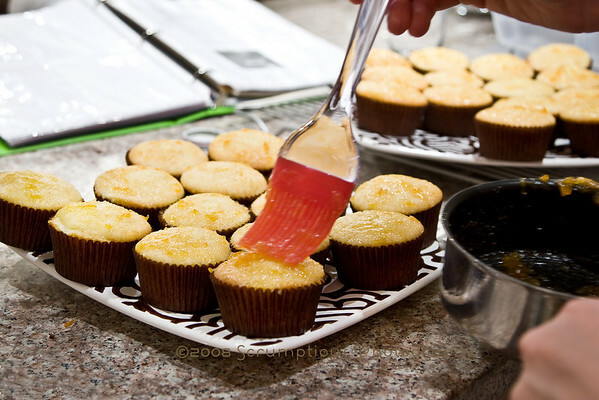 To minimize drips, hold the cupcake above the fondant for a bit so that the excess drips back into the bowl. Let it sit for a minute so the fondant begins to set. If you want, dip it a second time to get a thicker layer of fondant. Pipe three lines of chocolate on top, and then take a toothpick and drag it across the lines of chocolate so it creates a point in each line. Then, move the toothpick to the middle of the cupcake and drag the toothpick in the other direction across the lines. Finally, move the toothpick to the other side and drag once again in the first direction. This will create the signature Napoleon curly-bracket decoration. What a BEYOND magnificent take on the traditional Napoleon dessert for the birthday celebration - yum! Your cupcakes are absolutely beautiful! Wonderful! 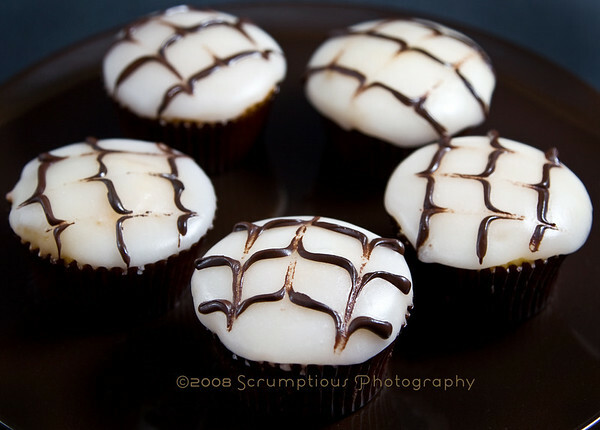 I love how these cupcakes look and they sound very tasty! I definitely put these on my must-bake list! These are so great! I'm starting to familiarize myself with fondant...there's nothing easy about it! They look delicious -- and beautiful! Those are the prettiest and most delicious looking cupcakes I have seen in a while! Great idea Kim! And thanks for the creds! thanks for the compliments, everyone :) i really appreciate it! Your cupcakes are gorgeous as well as your photos. These look awesome! I like Billy's Vanilla Vanilla recipe, too, it's a keeper! Kim, these are absolutely wonderful! They look so beautiful - I'll be trying them for my sister's birthday next month! What wonderful cupcakes! You did a marvelous job! I have to make these for my husband - he loves Napoleons. These look amazing! 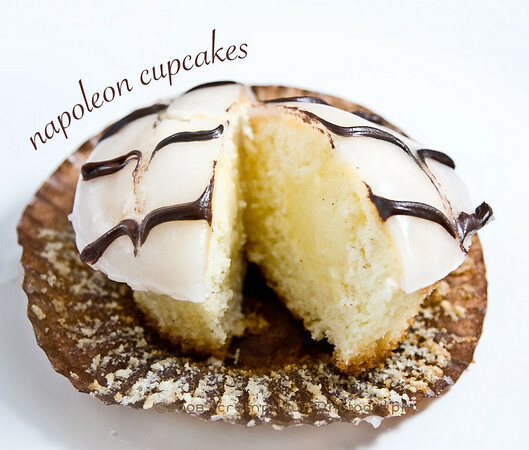 What an incredible idea: napoleon cupcakes. Those cupcakes look amazing!! Your decorating skills are great!! I've tried so many cupcake recipes, but they've all ended up too dense (like a pound cake) or too dry. It's nice to hear that you had great results with Billy's recipe because that was on the next on my to try list for cupcakes. Wow, these are really delicious looking and it looks like all your effort was well worth it! yum! Oh, boy! The look absolutely delicious. I love the fondant top. Those look amazing, nice job! So creative and beautiful too. @sophie, i've added you to my sidebar!